Yes, it’s Mercury retrograde, from 17 November to 6 December 2018 (some may feel the ‘shadow’ a week or two either side). No, you don’t need to freak out. Here’s why! 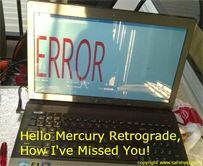 After receiving an email forecast today, where the author was grumpy about Mercury retrograde, I threw up my hands and said, ‘I’m sick of this spiritual whitewashing. Time to spread some light!’ While I’m a numerologist, not an astrologer, I work intimately with global and personal energies. On average, I’ve done a one-on-one psychic reading for someone, every day for the past six years and my connection with Spirit is rock solid. It’s like being an experienced surfer – I can predict and feel the waves coming, often before they turn up. Case in point – at the Conscious Life Festival, I said to a client, ‘you’re a Master 33 – please, do things twice as slow so you don’t have to repeat them, otherwise it will be chaos’. One second later, the fire alarm went off and we had to exit the building, so she ended up having two readings with me. Stay tuned for a blog on this (the audio clip is v. amusing). Mercury retrograde is the spiritual ad break we need to take (especially if you hate ad breaks – your body really needs the TLC.) A time when the Universe goes ‘are you with the right program?’, ‘we need to turn a corner’ or ‘I need to train new staff, please be patient’. Trust me, you want this to happen, otherwise it’s like a school day that’s all exams and no lunchtime. We’d never have a chance to visit to the toilet and let go, physically or metaphysically speaking! True story, during a Mercury retrograde, I pulled the card saying ‘let it go’ three times in a row before going to work. On arrival, I was told that, due to a double-booking they didn’t need me. So I sat down at a cafe just as a song was just finishing. It’s last line was ‘let it go’. I thought, hm how perfect. Shortly afterwards, the song ‘Let It Go’ from the movie Frozen started playing. Even cooler! Intuition really is the inner teacher (tutor) who keeps you on track. 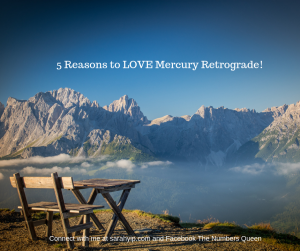 Here are 5 Reasons to Love Mercury Retrograde – The Ad Break You Need to Take! 2) It gives you a chance to go home. 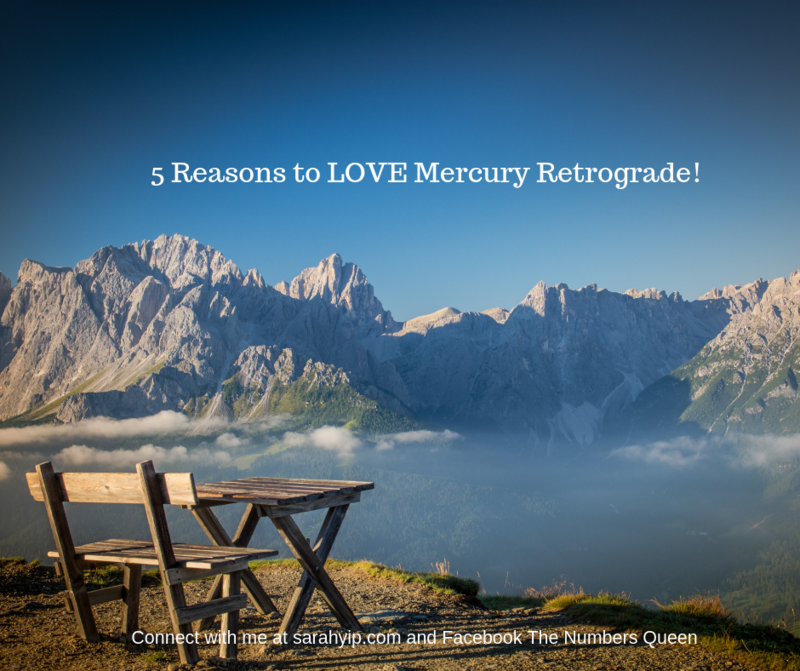 Mercury retrograde is the perfect time to explore your inner spaces, detox and declutter. I recommend turning off your phone and computer as much as possible, especially if they are glitching (that’s a sign they – and you – are approaching burnout). Instead of fighting life, catch up with loved ones, visit family homes or places you have been before (in this or previous lifetimes – sacred sites and temples are ideal). Travel is fine as long as you allow extra time and stay positive. Yes, your flight might be cancelled, but if you stay open, you might get upgraded or sit next to someone who will change your life. I often meet people ‘randomly’ who I haven’t seen in years but have been thinking about. 3) It gets you out of your head/ car which is good for the planet and your longevity. Traffic delays are common during Mercury retrograde, as people feel tired and confused, especially if they don’t trust their inner guidance (which told them to take the day off.) Despite my good intuition, I had car brake failure this week, which I interpreted as a ‘failure to break’ – I’ve been working overtime and this was a reminder to slow down. More on psy-car-logy. In more than one Mercury retrograde, my car battery has gone inexplicably flat, only to revive the day Mercury goes direct (!) The first time it happened, I turned on the radio and the song ‘Let’s Get It Started’ came on! When you have confidence in your instincts, your healthy ego is able to repel energy vampires and you become a source of power in the world, instead of reliant on other people to prop you up and give you approval. Sound good? Mercury retrograde is the best time to let people down to raise them up and find new ways to get from A to B. 4) It gives your heart the microphone and a chance to DJ. Most of us live in a hyper-masculine world of doing, working, thinking and controlling. During a Mercury retrograde, your mind gets pushed to one side so it can rest and your heart can break out and show you what love can do. If you feel an urge to sing, dance, paint, create and go outside, do so – you only get a Mercury retrograde a few times a year and you don’t want to miss the magic. If you’ve been living from the heart and your life is full of things/ people/ work you love and do for satisfaction, a Mercury retrograde can bring miracles and laughter galore. However, if you’ve been stuck in your head/ indoors/ fear-ville, there may be a few shocks as you realise that you’re not in control of the Universe! Don’t worry, just remember the quote ‘those who matter, don’t mind and those who mind, don’t matter.’ Maybe next time, write the dates in your diary and review posts like this (or have a reading*) to prepare for the transition. Did you know? This Mercury retrograde is in Sagittarius (the ’11th hour’ on the astrological clock) and we’ve just passed through the 11/11/2018 (11:11) portal of awakening in November 2018, the 11th month of a Universal 11 Year of Wake Ups and Breakups in numerology. We’re being paused on purpose, to check we have integrated the lessons before we’re moved up a grade, so to speak…Venus retrograde finishes just as Mercury retrogrades so this really is time to close off those can-opener jobs and relationships. I hope this article brings some comfort and joy to your Mercury retrograde ‘spiritual vacation’. Use it wisely and you’ll love what 2019 – a Universal 3 Year of Creativity and Inner Child Healing brings in next. Will be in touch again soon. P.S. In numerology, all words, names and addresses can be reduced to a number vibration (see the system). MERCURY RETROGRADE = 4593397 9529679145 = 97/16/7 vibration. 16/7 (a Karmic Debt Number*) is about using free will to open (or close) your eyes and mind, to create Heaven on Earth (7 energy – Crown Chakra Healing). This is a time to heal your Halo and to be a Spiritual Teacher. No wonder I just cut all my hair off (a blog is coming) because they say ‘your hair is the crown you never take off’. I needed to lost a weight off my shoulders. How about you? Here’s wishing you a beautiful few weeks of myth-busting and manifesting miracles. “The pattern: Using free will (1st or Root Chakra energy) to block the flow of higher wisdom and psychic ability (6th or Third Eye Chakra). -Subscribe to my articles (see pop up on homepage). Facebook doesn’t always show you all my posts. -Write me feedback below. Comments will be published once they have been approved. Or, for greater clarity, book a reading with me to discover your soul contract and 2018 forecast. it’s worth the suspense – see feedback. I also teach numerology and palmistry workshops in Brisbane. For a reading within 7-14 days, book a Tarot reading in Brisbane with my husband Kris on 0428 626 727. Read more about Kris, my 11:11 Soulmate. Mercury Retrograde 18 May to 11 June 2015 – A Time For Stew, Not Stewing?